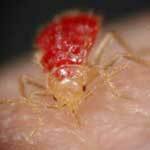 Bed bug bites symptoms may not be noticed right away or at all, and may be mistaken for other types of insect bites instead unless you actually see the bugs responsible. What do bed bug bites look like, and how can you tell if these insects are responsible for the bites you are noticing? Bed bugs are small insects which may appear similar to ticks or small cockroaches, and they have wings although they cannot fly. Identifying insect bites caused by bed bugs can be difficult, because often these bites will resemble those left by other insects. Usually the initial bite does not itch right away, but over time will notice redness, swelling, and itching. If the bites are scratched repeatedly they can become infected and antibiotics may be needed because of a secondary infection at the site.